I hereby dub thee Sir Cuitous. Have you ever been jonesing for a puzzly challenge, but your phone’s dead and you don’t have any puzzle books with you and nobody wants to play 20 Questions or Hangman? What is a desperate, puzzle-hungry person to do in a situation like this? Well, if you’ve got a chessboard and a knight (or just some graph paper and a pencil, if you want to go bare-bones with it), you’ve got a puzzle waiting to happen. 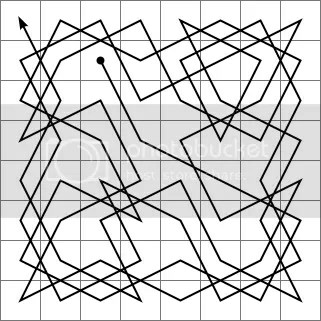 It’s called a knight’s tour, and the challenge is to place the knight anywhere on the board and, moving the piece as you would in a regular game of chess, you hit every square on the board once. It’s tougher than you’d think, and if you desire an even greater challenge, you could go for a closed tour, where the knight touches every square just once AND returns to the starting square. Knight’s tours are common mathematical problems for computer science and programming students to this day, with the endgame being to write an algorithm that will find a knight’s tour for a given grid. A variation on the knight’s tour is the uncrossed knight’s tour, where the goal is the same but you’ve got the added wrinkle of not being able to cross your knight’s path at any point. But you don’t have to stick to an 8×8 grid by any means. Any square or rectangular grid can offer a suitable challenge to the aspiring knight’s tour hunter. There’s nothing quite like a DIY brain teaser to keep your wits sharp. So no matter where you are, remember to keep calm and puzzle on. I’ll catch you next time. This entry was posted in Puzzles and tagged DIY puzzling, Geeking Out, Puzzlin' fool by gmdirect. Bookmark the permalink.